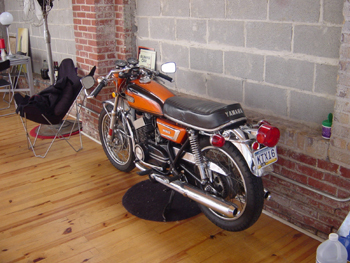 Dr. Laverda writes about the joys and woes of vintage motorcycles... some damn funny writing here. This is a must-read! And it's been called "a work of art"... gotta love that! Took a friend and I, a long 2x4, much grunting, some profanity and a few tense moments, and it was in. I rather like it inside, it really is a conversation piece. I find myself sitting on it regularly.